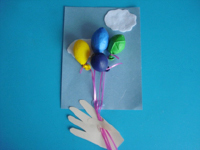 A colourful three-dimensional collage for little hands. 1. Gather your material. 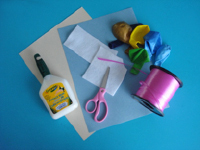 You will need light pink or beige (skin color) construction paper, blue construction paper, scraps of white felt, balloons, ribbon, white glue, and scissors. 2. 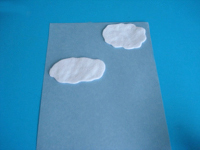 Cut two cloud shapes out of the white felt and glue them near the top of the blue construction paper, placed vertically in front of you. 3. 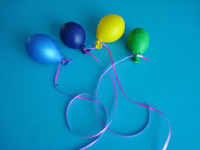 Barely inflate four balloons as shown. Attach a piece of ribbon to each knotted end. 4. 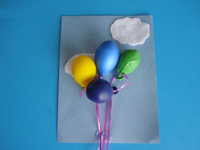 Glue the balloons in the centre of the blue construction paper, letting the ribbons hang below them as if the balloons were floating away. 5. 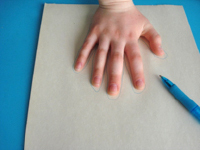 Trace the child's hand on the light pink or beige construction paper and cut out the outline. 6. 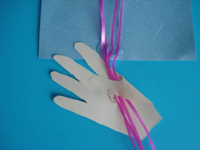 Glue each ribbon in the palm of the hand outline. 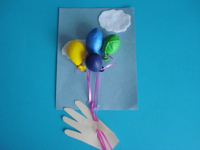 Fold the thumb over them and glue it in place. 7. Display on a wall.